Naturalist Peggy Larson calls the desert "a mosaic of miniature worlds." The desert can be a hostile place, but these miniature worlds provide habitats for many diverse life forms. Hidden Valley is one such world. The rocks ringing the valley block the wind and collect moisture, creating a special microclimate that supports many plant and animal species. This secluded valley has also appealed to humans, both past and present, as a source of food, protection, and for its special beauty. 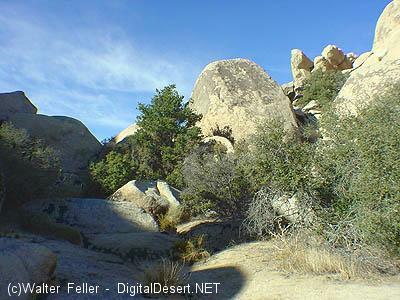 The opening to Hidden Valley is not readily apparent, and looks the same as many other rockpiles.